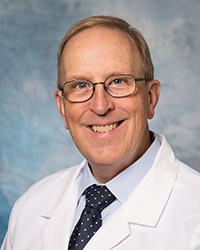 Dr. King is a board certified family physician who has served as Chair of the Department of Family Medicine at West Virginia University since 2012. Prior to that he was Vice Chair of Family Medicine and Director of Research at Medical University of South Carolina, and previously, was on the faculty of the East Carolina University Brody School of Medicine. Throughout his career he has been a clinical researcher and educator with several areas of emphasis including lung disease, cardiovascular risk reduction, and clinical epidemiology. He was co-founder of the WV Practice-Based Research Network and is a senior leader in the WV Clinical Translational Science Institute. He has been a leader of the North American Primary Care Research Group (NAPCRG) since early in his career and currently is an officer on the Executive Board. He has been a national speaker for the American Academy of Family Physicians on lung disease and other topics. Dr. King has published over 100 peer-reviewed research publications and his work has been recognized with a Distinguished Paper at NAPCRG and has been a finalist for paper of the year at the Society of Teachers of Family Medicine. He enjoys time with family and is an avid road bike cyclist. Dr. King is an experienced lecturer and maintains an active clinical practice.